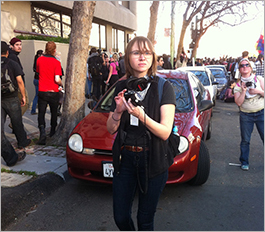 March 29, 2013 – When the Occupy movement hit Oakland, California, in 2011, Susie Cagle immersed herself in scenes of public protest – camera, notebook and Twitter feed at hand. At this point, she had been editing and freelancing for more than eight years, but authorities didn’t take her role as an independent reporter seriously. On more than one occasion, police arrested her. The Society of Professional Journalists rallied to her defense. in the Digital News Frontier grantees, Cagle promises to deliver a thorough exploration of a single social issue in Oakland each year, starting with gun violence. With a natural disposition for risk-taking, Cagle brings a crucial set of experiences, design innovation, and understanding of access to her project. 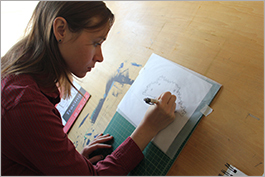 From her literature and creative writing studies at the University of California in Santa Barbara to the completion of her Masters in Magazine Journalism from Columbia University in 2006, Cagle had always exercised editorial creativity. Industry-wide layoffs in 2008, however, provoked her to fully embrace an experimental, non-linear path in media. 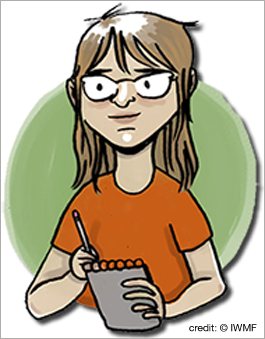 Cagle successfully pieced together a six-year stretch as a freelance reporter and illustrator, crowd-sourcing her income when she covered Occupy Oakland largely on her own dime. While Cagle had learned to become her own professional advocate, she realized that nobody was adequately giving voice to survivors of gun violence in the Bay Area. This media void contributed to a vicious cycle of disenfranchisement – those who were affected by gun violence had no space to productively express their grievances and outsiders were left to harbor negative stereotypes of the city. The gun violence pilot project, Shine in Peace, encompasses a well-rounded mix of community narratives, data visualizations, maps, statistics, audio, illustrations, and photos. In addition to securing the support of the IWMF, Cagle has partnered with students at UC Berkeley’s Graduate School of Journalism, the Dart Society of violence reporters, and the Center for Investigative Reporting on this initial reporting project. The digital platform design for The Oakland Projects, she contends, holds just as much weight as the content itself. In practice, Cagle’s appreciation for design includes a fair amount of white space to lead the reader’s eye along and no distracting sidebars or advertisement links. Conveniently, this guiding set of design principles adapts well to a mobile platform as well. All of these design elements take issues of accessibility into account. From the perspective of someone with mild dyslexia, Cagle says the clean layout makes it easier for her to read a story. Further prioritizing easy access, The Oakland Projects embeds all audio and video content with free tools like SoundCloud and Vimeo to avoid holding this content hostage, as Cagle puts it, with “crazy in-house widgets.” Integrating outside multimedia platforms into her design, Cagle sees greater potential for reader engagement with the content on social media. Perhaps most importantly, catering to mobile platforms helps insure that The Oakland Projects transcends the socioeconomic digital divide. Not everyone owns a personal computer, but many more potential readers own smart phones. Shine in Peace invites both those directly affected by gun violence as well as those apt to pass judgment on affected communities to arrive at a deeper understanding of this complex social issue. To access multiple angles on things like the effects of trauma in communities, the realities of victims’ compensation, and the impact of advocacy programs, Cagle employs professional writers and journalism graduate students. This year she also plans to initiate a journalism mentorship program with local high school students who witness the effects of gun violence in their communities first hand. Right now, a majority of the project’s contributing writers are women. This gender breakdown caught Cagle by surprise. She is all too familiar with the preference that cops grant male reporters at the scene of a crime. At the same time, she recognizes more informal, underutilized pockets of access that favor female reporters. Determined to maintain a professional set of media standards for The Oakland Projects, Cagle intends to use the $20,000 from IWMF to pay her writers. If possible, Cagle intends to secure nonprofit status for her media project. The nonprofit model is something that she feels more comfortable with, despite the fact this business approach has not fully integrated into the media industry. Fortunately, IWMF will be providing Cagle with legal consults so she can carefully work through this new terrain. The business end of things may be new to Cagle, but she has always surrounded herself with women unafraid of taking professional risks. For her, this network now includes fellow IWMF digital media start up grantees and alumnae. Drawing inspiration from her friend and past IWMF grantee, Erin Polgreen, the creator of Symbolia, Cagle looks to emulate some of Polgreen’s tactics: setting goals for sustainable growth, being nimble and open to change, and making sure to put the creators first. Once Cagle has established a successful business model for The Oakland Projects, she admits she would be more than happy to replace her managerial self to concentrate on writing and editing. 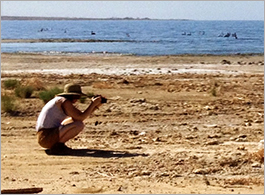 In terms of fulfilling her digital media vision, she has had to temporarily shelve her passion for reporting. Entrepreneurial initiatives do involve sacrifice. In Cagle’s opinion, however, those sacrifices are well worth it.